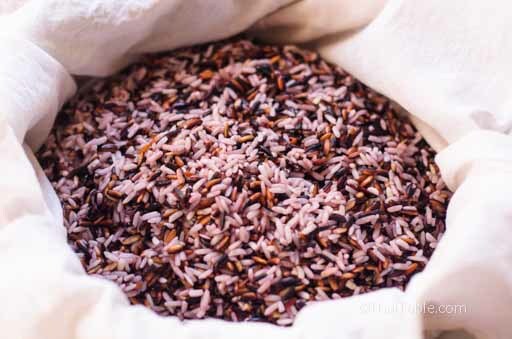 I spent 2 weeks testing the rice cooker with various kinds of rice: jasmine rice, red cargo rice, Japanese sushi rice, white and black sticky rice. The rice cooks more quickly with this rice cooker than my more expensive, fuzzy logic rice cooker. The rice though, is slightly harder than than a fuzzy logic rice cooker’s rice, but the difference is subtle. The rice cooker is round, white with glass lid which has a white plastic knob. The clean look is far cry from my 1980’s pink floral design Tiger brand rice cooker. The inner stainless steel pot is shiny and feels really good, thick and durable. The rice cooker takes up as much counter space as any other rice cookers. The most inconvenient feature is the plug. After each use the rice cooker has to be unplugged, otherwise, it’s automatically in the warm state. For someone who eats rice 3 meals a day, it’s very cumbersome to have to unplug and replug. The removable glass lid is one of my favorite features, similar to glass window on an oven door; I don’t have to open the lid to see what’s going on. On some reviews, people have complained that this type of lid allows steam and boiling water to spatter out onto nearby things. I only encountered small speckles around the rim of the inner stainless steel pot which didn’t bother me at all. I like that I can take the lid and clean it in a dishwasher. This type of lid also allows the steamer to sit right on top. Many people wonder if the rice will stick to the bottom when it’s not non-stick. When you try to remove hot rice from the cooker, some grains stick to the hot surface. However, when the rice and pot cools down, the rice is easily removed with a spatula. The stainless steel inner pot can go into the dishwasher as well. I find that it cleans best if I soak the pot in water prior to loading it in the dishwasher. When I do clean the pot by hand, I only need the soft sponge, not the scrubby one. Rice is cooked within 15 minutes. The manufacturer suggests waiting 15 minutes after the rice cooker’s button pops to allow the rice to continue to get properly done. I tried the rice after it’s cooked, without waiting 15 minutes and found that the rice was on the edge of being fully cooked. The most inner part of the grain was not as soft as the outer part. After 10 minutes of waiting, the rice was cooked thoroughly. The first activity that I do when preparing a meal is cook the rice. And I find that I never have to wait for the rice to be done. By the time I’m ready to eat, the rice is ready for me. The key to cooking jasmine rice so that the rice expresses its unique quality of soft texture is the right ratio of rice to water. Miracle Exclusive is the only brand that I’ve used that marks out what I think is the perfect ratio of jasmine rice and water. The rice cup matches perfectly with the water line inside the inner pot. Most rice cookers errs on too much water. 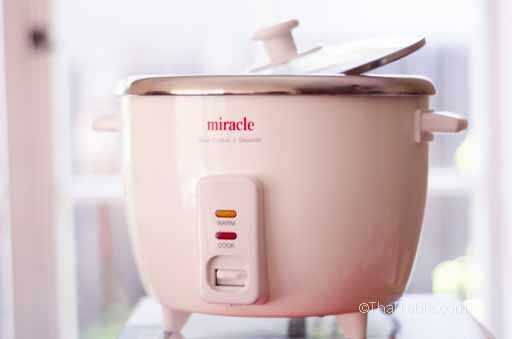 This rice cooker is capable of cooking 8 cups of rice. Eight cups of rice is a lot of rice! For a meal of 4-6 people, 4 cups of uncooked rice is about right. Because of the wide bottom and its large capacity, cooking smaller amount of rice ie. 1 cup will result in a lot of rice sticking to the bottom. You may want to increase the water by 5 - 10%. The rice cooker is in the $60 -$80 range on Amazon, sitting right in the middle between the fancy fuzzy logic ones and the el cheapo aluminum one. A clear advantage why people pick this rice cooker is because of its stainless steel inner pot. Many people are avoiding using teflon and aluminum inner pots for health reasons. 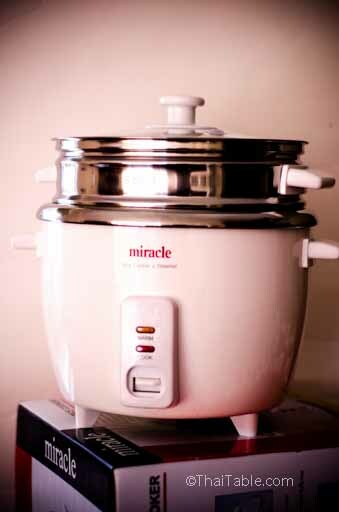 Miracle Exclusive answers this concern with a stainless steel inner pot with clear glass lid. The steamer was a pleasant surprise. I have a Revere 2-quart steamer that fits on top of a 2-quart pot. 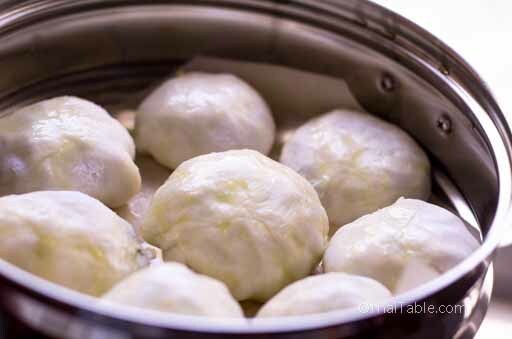 The Miracle Exclusive steamer is wider, similar to an Asian steamer with large holes. With this added benefit, I didn’t need another steamer. 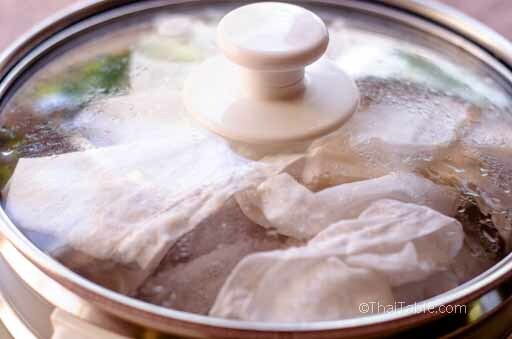 I can steam sticky rice easily and quickly. 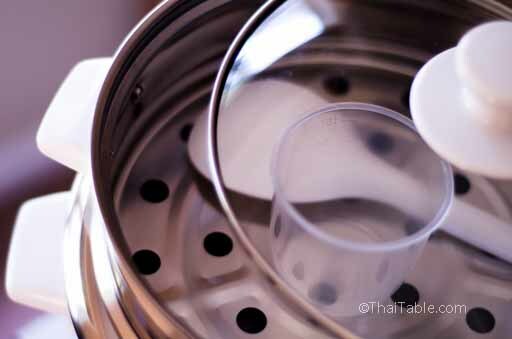 Other dishes that need steaming with plates like steamed fish or Thai snack can be done easily, too.